The Harvard and Penn men’s lacrosse teams both entered Saturday’s contest in Philadelphia, Penn., looking to break out of weeks-long funks. While the Crimson had dropped two in a row, the Quakers had lost their past three, and with the calendar inching towards May, when the top four squads in the Ivy League will be invited to New York to participate in the conference tournament, every loss was becoming more and more costly. Accordingly, the two sides came out of the locker rooms with a sense of urgency, putting up a combined nine shots in the first six minutes of action. 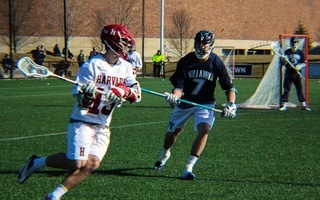 Senior midfielder Carney Mahon opened the scoring for Harvard at the 11:01 mark of the quarter, but Penn had its chances as well, with sophomore attackman Adam Goldner forcing a good save from Crimson netminder Robert Shaw just two minutes later. By the time the teams reached halftime, they had traded 3-0 runs and were back to square one, knotted at 3-3. In the third quarter, however, the Quakers cranked up the intensity on offense, putting four in a row past Shaw in quick succession to cap a 7-0 run spanning nearly 30 minutes. The home side never looked back, keeping its opponents at bay throughout the rest of the half to secure a 11-7 victory. With the four-goal win, Penn (6-6, 2-3 Ivy) puts itself back in contention for a spot in the Ivy tournament. The Quakers now sit in fifth place in the conference standings, a half-game behind Brown (5-5, 2-2) and Harvard (7-4, 2-2), each with one fewer loss. The Crimson, meanwhile finds itself with a must-win next week at home against Princeton (6-5, 1-3) before finishing off the season against undefeated No. 6 Yale (9-2, 5-0). It certainly has been a difficult “road trip” for the Crimson, as the team has been outscored, 40-24, in three consecutive losses away from Cambridge, Mass. The schedule was undoubtedly a factor, with Harvard facing off against Albany and Cornell, which were ranked No. 1 and No. 10 at the time, respectively, before taking on Penn, who beat another former No. 1, Duke, earlier this year. 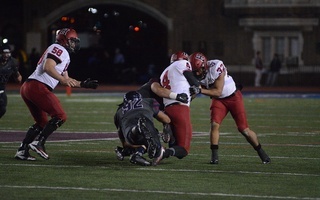 Against the Quakers, perhaps the weakest of the three opponents, however, the Crimson finally had the start it wanted. Harvard raced out to a 3-0 lead on the contributions of Mahon and the team’s two leading goal scorers, senior Morgan Cheek and sophomore Kyle Anderson. The offense then went silent, however, not finding the back of the net between the 2:27 mark of the first quarter and the 0:01 mark of the third. If it were not for Anderson’s goal in the final second of the third quarter, Harvard would have gone scoreless in the frame. As is, the troubling trend of poor starts after halftime continues. During its losing streak, the Crimson has now been outscored by its opponents by a total margin of 12-3 in the third quarters, leaving the team to watch as tight games turn into big deficits before even reaching the final period. Harvard turned the ball over five times in that frame, compared to nine all game for the Quakers. Converting man-up opportunities was another aspect of the Crimson performance that was lacking on Saturday, as the team went 0-6 in such opportunities. Penn committed seven penalties, giving their visitors a full 5:30 of man-up play. Harvard, however, was not able to capitalize. In terms of individual performances, Goldner and senior attackman Kevin McGeary led the way for the Quakers with four points apiece, while Cheek matched their output in a losing effort. Despite starting off close games, the Crimson dropped both decisions to the top ranked teams in the Ivy League. The Crimson came close to beating the Quakers, but one goal made the difference in the game.